Better customer conversations. Better results. We design and carry out a programme of customer interventions to deepen relationships with existing customers. Today, insurers interact with existing customers through inbound calls, emails, web chat or outbound calls. But these conversations are almost always reactive. They are rarely adapted to a customer’s current circumstances and needs. Customer-facing staff and distributors could do much more if we give them the right prompts and insights to have the right conversation with the right customer at the right time. Insurers do not yet have the processes, systems or insights to do this and therefore miss out on the opportunity to achieve better customer engagement with their vast existing customer base. Working in partnership with insurers, we design and carry out a programme of customer interventions with existing customers. Our campaign work to date typically achieves results which are between 5x and 15x more successful than what the insurer is doing today. 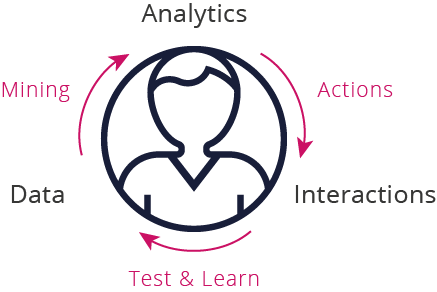 We bring together the data analytics, the tools to get insights into the hands of customer-facing staff and distributors, and the test and learn tools to enable us to experiment and learn and improve together. Using approaches such as machine learning and data mining, we identify the right interventions for the right customers at the right time. Our CAFE technology suite enables interventions to be managed at scale by providing workflow, management and insight tools. We test and learn and improve by collecting and analysing real-time feedback from customers, distributors and service agents. As a boutique Insurtech we partner with insurers that have an ambition to be leaders in customer management. Our campaigns have worked across multiple countries, markets and regulatory regimes. An insurer wished to address the problem that a large number of customers were stopping paying their protection premiums on a block of the in-force. This was a significant commercial impact costing EUR millions a year. We agreed to pilot our approach in this area. Some customers were stopping because their needs had changed or they had a better or cheaper offer. But other customers were stopping due to service issues, disengaged advisors or a lack of communication from the insurer. These losses should have been avoidable and were a problem for both the customer and the insurer. The insurer wished to offer to recommence the policy for these customers, but needed to identify which customers to contact and how best to approach the conversation with them. We worked in partnership with the insurer to pilot our approach, analytics and tools over a period of six months across two distribution channels. We used machine learning and data mining to identify the best customers to target. Together we identified the conversations and feedback we wanted to capture from each customer interaction. We installed our CAFE technology for the pilot period to manage the campaign of actions and capture the feedback from each interaction. We ran a test and learn cycle with the results and feedback data captured. The pilot achieved a success rate with customers that was 10x relative to the current processes. 90% of the customers appreciated the contact from the insurer. Many also fed back that they were very pleased the insurer was contacting them proactively. Almost 50% of the customers contacted wished to recommence their insurance with the insurer. This was good evidence that the analytics was targeting the right customers and the customer-facing staff were able to have the right conversations. The insurer achieved a significant commercial benefit as well as achieving good customer feedback.